The French know about and crave these round, buttery, flaky, almond-paste-filled creations, of course, and so do all expatriates living in France, but tourists and business people just passing through may miss them completely. So, I think these traditional “Kings’ Cakes” made for the feast of the Epiphany (celebrated on January 6) constitute one of the best kept secrets of French gastronomie! 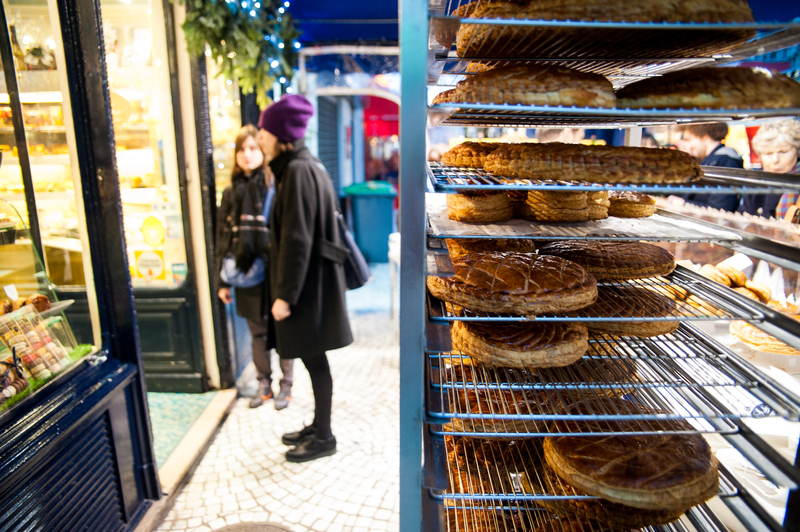 Because les galettes des rois appear for only about 4-6 weeks in the winter (roughly mid-December to the end of January), they cannot be experienced by the throngs that visit Paris and France any other time of year. Their appearance with plain-looking, brown crusts probably cause most winter tourists to pass over them, too, in favour of the fancier pastries filling every pastry shop display case. The flat cakes are most often sold whole, in sizes that can be divided into 4-10 portions, so finding just one slice to try can be tricky. When you do find one, though, please have it warmed up before eating! Although some folks might say they are good cold, they approach sublime when heated in an oven, and only then will the almond and butter fragrance waft from the wedges—fully half the experience in my book! Everyone gets into the act: co-workers will share them in the office; friends will get together just to share one; kids at school often make them in class; families welcome the chance to stretch the holidays just a little longer with this tiny celebration, usually washed down with “hard” apple cider (the drier brut has a slightly higher alcohol content than the sweeter doux), or sometimes Champagne. In tea salons, you may wish to have a warm slice with coffee or tea, of course. Are you after a ‘real’ French experience? You just found one! David Lebovitz has an excellent recipe for making them at home (so easy! ), so now you have no excuse not to discover these for yourself if you missed them on your last trip to France; here it is: http://www.davidlebovitz.com/2014/01/galette-des-rois-kings-cake-recipe The almond-crème or frangipane filling is traditional, but some pastry chefs are experimenting with new fillings, too. Beneath these plain brown wrappers? Bonne Année! Et Meilleurs Voeux en 2016! Oysters, fresh fish and lemons; foie gras and nut-studded breads; Boudin blanc sausages and various fattened fowl; platters of at least five assorted cheeses, bien sûr; and candied chestnuts; a belated bûche de Noël or an early galette des rois–and, of course, Champagne! Rounding out the shopping spree were fancy chocolates and bouquets of flowers. Whether going out in style, or staying in to watch movies and finish this year’s 1000-piece puzzle, the New Year’s Eve meal in France is paramount. My family is more often than not the “staying in” type and we’re ready with food and movies and “Bananagrams!” And, we’re making resolutions, too. In 2016, I hereby resolve to renew my blogging efforts and post more often and regularly! I wish peace, happiness, health and prosperity to you all in 2016. Happy New Year! What delights can be found inside plain brown wrappers! I’m speaking of French pastries, of course—specifically the seasonal Galette des Rois. Hidden inside the round, golden brown, rather “plain Jane,” shiny, flaky, buttery crusts is (usually) frangipane, the traditional almond cream filling of les galettes des Rois, or the Kings’ Cakes. And, something else, too—a fêve! This will probably be the last week you can still find une galette des Rois in Paris pastry shops, until they reappear next December. Normally a specialty made for celebrating Epiphany, observed on January 6, I see this treat appear earlier and earlier each year—and stay around later and later, too. I have discovered Kings’ Cake as early as the first week of Advent and continue to find them through the week of La Fête de la Chandeleur, celebrated on February 2nd. For good reason!! The Cake: A centuries-old tradition, with regional variations and changes over time, certainly, today’s cakes are melt-in-your-mouth delicious—flaky, buttery crusts on the outside and crumbly-yet-creamy almond paste on the inside. Best served warm, the fragrance emanating from the oven as they bake is half the reason I love them. To make a terrific one at home, I suggest trying this recipe from acclaimed “foodie” author and professional pastry chef, David Lebovitz: http://www.davidlebovitz.com/2014/01/galette-des-rois-kings-cake-recipe/ Remaining little-known among the throngs of tourists who visit Paris each year (because of their winter-only appearance and being overshadowed by row upon row of more colourful and fancy pastries), they are loved by the French and all of the expatriates I know who call France at least their temporary home. It is the one French treat both of my sons ask for when they’re home for the holidays. 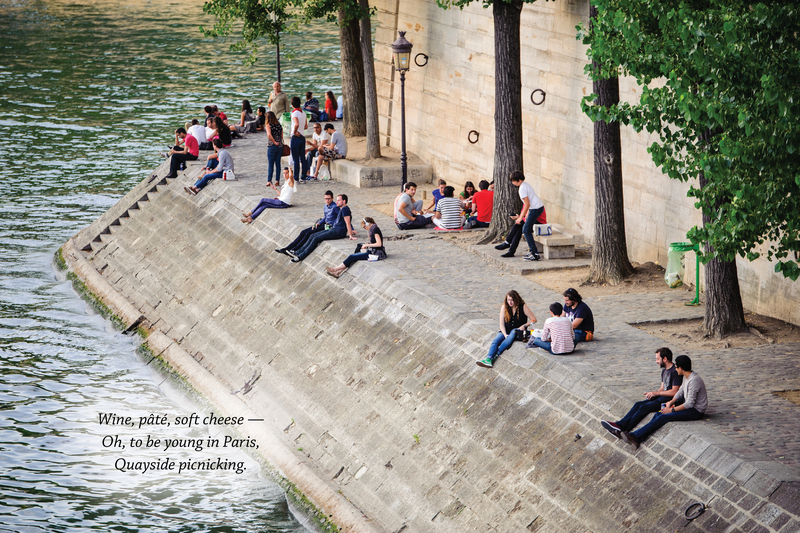 Seek them out if your future travel plans bring you to Paris in the wintertime; you’ll be glad you did. And now to explain that fêve! The Game: If you try the cake, try the traditional game, too! Ask the youngest child in the family to sit under the table and designate who receives each slice as the server puts them on the plates. The person who finds the fêve in his or her slice is king or queen for the day, chooses a consort to rule with him or her, and receives the gold-colored paper crown commonly sold with the cake (or, make your own crown at home!). The newly-crowned monarch rules for the day, giving (hopefully good-natured!) orders to all family members who join in the make-believe fun. How to capture all this in 17–or fewer–syllables?? Still enough summer left for a picnic or two! A quintessential summer joy, picnicking can be enjoyed by almost anyone, within any budget. Parisians love picnics; and Paris is very “picnicable.” Whether simple and impromptu with bohemian flair, or extravagant and well-organized with white linen, le picnic is très chic and tourists can join right in! What will you find for your picnic basket? Baguettes; all types of charcuterie including dried sausages (saucisson sec), pâtés, terrines, and rillettes (“potted” meats); hard and soft cheeses; butter, jams (les confitures), tapenades and other spreads; yogurts, fresh veggies and fruit; antipasti, cornichons (tiny gherkin pickles) and olives; water, wine and beer; and desserts. If you forget a knife or a cork screw, there’s a shop for those as well! There are several places to get bread and baguettes on the island. Try Auvray Delices at 35 rue des Deux Ponts, which also has sandwiches, boxed salads, wonderful pastries and some soft drinks. For fresh veggies, fruit and squeezed-while-you-wait orange juice bottled on site, go to green-grocer Les Vergers de L’île St-Louis at 23-25 rue des Deux Ponts. There are several fromageries for cheeses, but the one still open in August is La Ferme Saint Aubin at 76 rue Saint-Louis-en-l’ile. Some sandwiches and little savory quiches or tarts are on offer here, too. If you are a true gourmet, however, take your picnic up a notch gastronomically and head to 38 Saint Louis at 38 rue Saint-Louis-en-L’île. Specializing in small-producer delicacies and excellent wines, 38 Saint Louis is serious about good food, produced with care and pride. The stock at this épicerie fine shop has been carefully and personally selected by the proprietors, one of whom, Thibault, told me that “food is our first medicine; we should put only good food into our bodies.” This is the place to pick up chilled rosé wine (and good chilled beer), fresh antipasti, top-shelf charcuterie, farm-made fresh yogurts, and special cheeses. The brebis from Corsican sheep I brought home was tasty, complex, sweet, and firm, but melt-in-your-mouth creamy and smooth on the tongue—excellent! If you need some basics, there is a pair of convenience stores on the island; one of which is Le Marché des Iles at 19 rue des Deux Ponts. And, if you forgot either a knife or corkscrew, stop in and treat yourself to a true Made-in-France, quality souvenir at Coutellerie Laguiole Paris, 35 rue des Deux Ponts. They have a huge selection of pocket-knives and corkscrews made with rare artisan craftsmanship! They are among my favorite French keepsakes, and practical to boot. And last, but not least—dessert! Although you could take a dessert along in your picnic basket, you might want to pack up, stretch your legs and take a leisurely walk around the island in search of … ice cream. Almost no visit to the Ile Saint-Louis is complete without sampling Berthillon’s famous ice creams and sorbets (about 40 flavors each, with seasonal variations), at 29-31 rue Saint-Louis-en-l’ile. I’m humming this vintage anthem to summer in my head as I wish you all safe and pleasant upcoming August afternoons–with a nod to Nat King Cole for the catchy song. 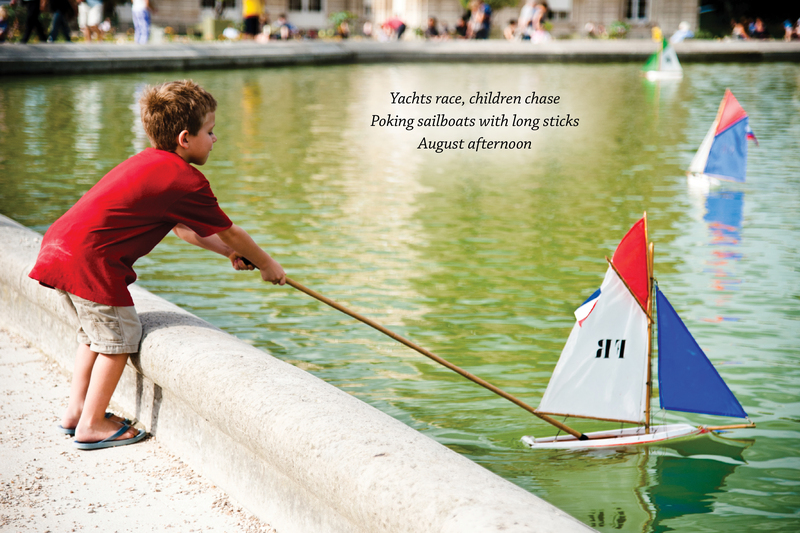 In addition to renting a little sailboat to sail on the pond, you might occupy children with the marionette puppet shows, pony rides, carousel, playground and sandbox in the Luxembourg Gardens. Top off these activities with ice cream or other treat and you’ve had a kid-perfect day in Paris! Vive la révolution! Vive la France! 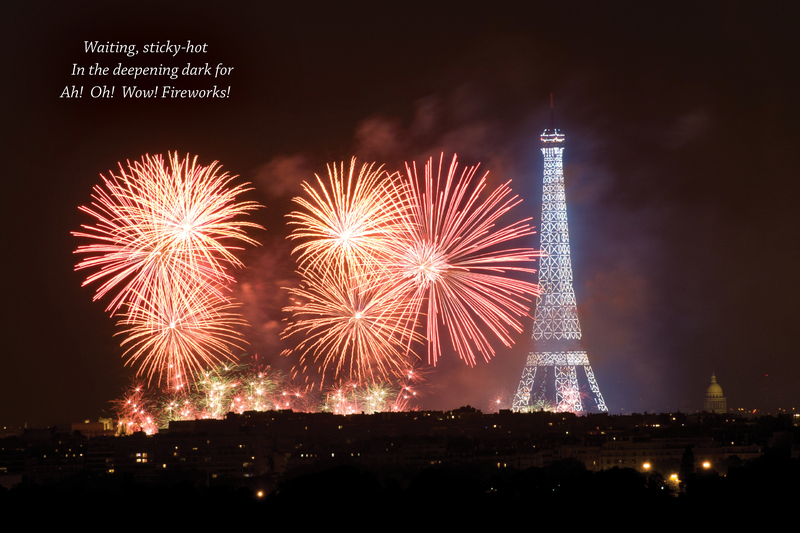 It’s La Fête Nationale–or “Bastille Day” to us Anglophones. Happy 14th of July to my French friends and France! Ah, wine. I thought I knew a bit about wine before I moved to France fourteen years ago. Little did I suspect how much more I had to learn. I’d participated in a dozen wine-tasting events in the US. I knew about grape varieties and ordered Cabernet Sauvignons and Pinot Noirs and Merlots. But that was not how my new French neighbors spoke of wine. No, sir. They spoke not of the cépage (grape varietals), but of the terroir (the region where the wine is produced). 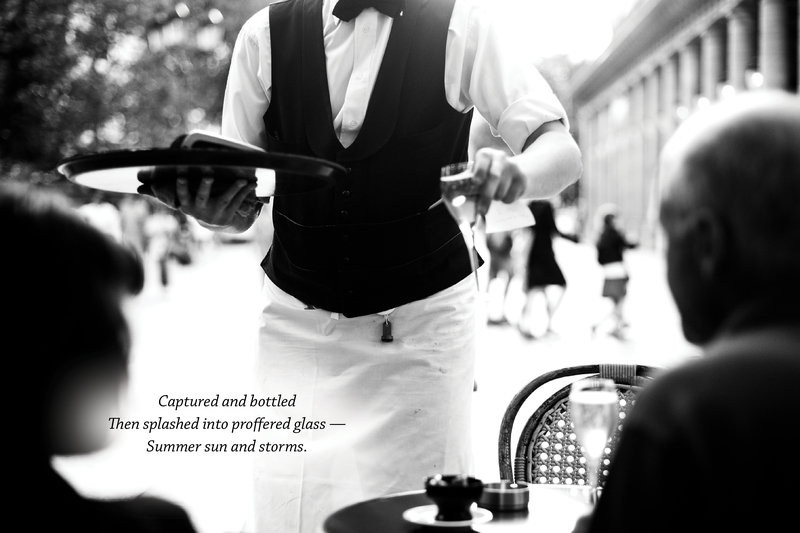 They ordered Burgundies and Bordeaux and Côtes du Rhônes, using the names of the major wine-producing regions. And to speak of the region, or terroir, was to summon all they knew of the “flavor” of the land: the qualities of the soil; the usual amount of rain; the average number of sunny days and thunderstorms; the range of temperatures and typical humidity during the growing season; the knowledge and care and skill and years of experience of the region’s main wine producers; the timing of the harvest and whether the grapes were harvested in bunches all at once or were selected grape berry by grape berry, one by one, later in the season; even the wind–and how all these factors influenced the flavor and quality of the wines. I have learned so much, and this new-found knowledge increased my appreciation of wine immensely. Today’s post is not meant to be a wine lesson, though. I capture here, below, my first 17-syllable impression of the passion for wine I found among most of my French acquaintances and friends … my “ah-ha” moment when I first appreciated all that had gone into the making of a very fine wine. When I savor wine now, I often think of one of my fourteen summers in France–where we ventured and what we discovered–and the bottles we brought back from every region, now lining the walls of the cellar, or la cave. Only our photos top these dusty-musty bottles as our favorite souvenirs. I would love to see your 17-syllable impressions of good wine! Will you accept the challenge?